Vidkun Abraham Lauritz Jonssøn Quisling was a Norwegian politician and officer, commonly known as one of World War II’s most infamous traitors. He held the office of Minister President of Norway from February 1, 1942, to the end of World War II, while the elected social democratic cabinet of Johan Nygaardsvold was exiled in London. Quisling was tried for high treason and executed by firing squad after the war. The term “quisling” has become a synonym in many European languages, including English, for traitor. When Germany invaded Norway on April 9, 1940, Quisling became the first person in history to announce a coup during a news broadcast, declaring an ad-hoc government during the confusion of the invasion, hoping that the Germans would support it. The background for this action was the flight northwards of the King and the government. Quisling had visited Adolf Hitler in Germany the year before, and was liked by Hitler, so Quisling’s belief that the Germans would back his government was not entirely unfounded. However, Quisling had little popular support, and the Quisling government lasted only five days, after which Josef Terboven was installed as Reichskommissar (Commissioner), the highest authority in Norway, reporting directly to Hitler. The relationship between Quisling and Terboven was tense, although Terboven, presumably seeing an advantage in having a Norwegian in a position of power to reduce resentment in the population, named Quisling to the post of “Minister President” (as opposed to Prime Minister) in 1942, a position the self-appointed “Führer” assumed in 1943, on February 1. Vidkun Quisling stayed in power until he was arrested May 9, 1945, in a mansion on Bygdøy in Oslo that he called Gimle after the place in Norse mythology where the survivors of Ragnarok were to live. The document has been put up for auction but was not sold. 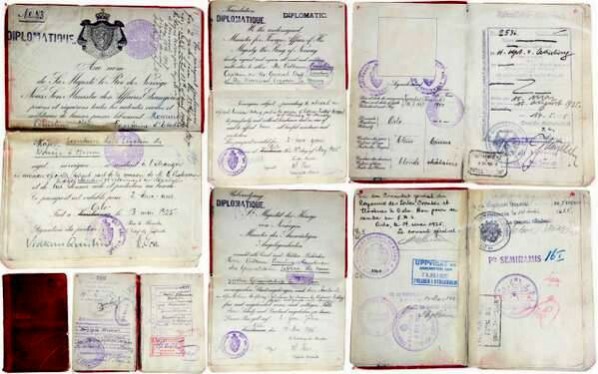 The initial price was 5700 EUR for the NORWEGIAN DIPLOMATIC PASSPORT he used while he was a diplomat stationed in Moscow between 1925 and 1930, a period in which he travelled extensively in the newly established Soviet Union and Eastern Europe. Vidkun Quisling’s widow Maria, who fell on hard times during the 1960s, is thought to have sold the passport, along with a number of other documents, through her lawyer, although according to Dagbladet passport may also have been first sold in 1983 when her estate was auctioned after her death.